Kara Birkenstock is your source for all things GLAM, AFFORDABLE, & LUXURIOUS! From dishing out celebrity fashion secrets on the Oscar Red Carpet to sharing the latest foodie finds and travel destinations, Kara is your GAL! Kara is a TV Host, Style Expert, Producer, National Brand Spokeswoman, Actress, and Model. 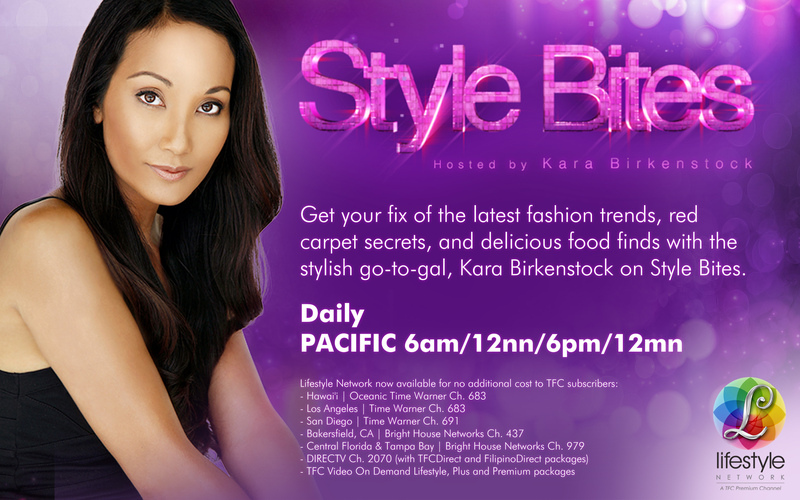 As Writer, Director, Producer and Host of “Style Bites” on the Lifestyle Network, Kara grants exclusive access to the latest restaurants and hotspots, offers tips on how to achieve the latest trends and reveals coveted secrets from fashion and beauty insiders. “Style Bites is the ultimate bible on chic living,” said Olivia de Jesus, Managing Director for ABS-CBN International North America. As creator of the lifestyle blog Your GAL Kara, Kara highlights the best in the worlds of fashion, food and travel. As Fashion Editor for Positively Celebrity, Kara shares her love for accessible star style and advice on how to get the look for less. Kara was also a featured Style Expert on TV Guide Network’s Red Carpet “Fashion Wrap,” covering all the fashion hits and misses of today’s hottest celebs. Kara has had the pleasure of working with renowned companies such as DSW Shoes, Acuvue Brand Contact Lenses, Johnson & Johnson, Target, Bare Minerals, Frito Lay and Intel. With her friendly and approachable style, Kara has been featured on TV Guide Network, Style, Access Hollywood and the KTLA Morning News, to name a few. With a background in public relations, marketing, and event planning, Kara knows the business of fashion. Kara is at the pulse of the fashion industry, having represented world renowned brands and new designers alike. Kara has also produced galas and fashion shows for Los Angeles Fashion Week, launched celebrated restaurants, and coordinated events in the world of education and technology. Coming from a family of chefs and international restaurateurs, Kara is also passionate about discovering the best in food, restaurants, and travel. Staying true to her Southeast Asian roots, Kara can’t resist spicy cuisine and adores exotic, tropical destinations. Kara is of Thai and Filipina decent and lives in Los Angeles, CA. And yes, her real last name is Birkenstock!